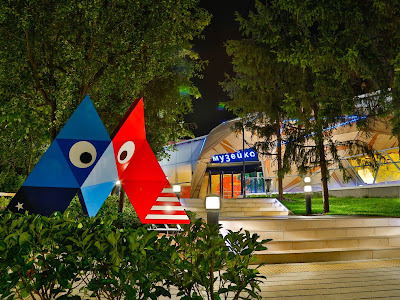 Muzeiko, the first Children's Museum in Bulgaria (and really the first truly interactive museum in that entire part of the world ...) opened officially on October 1st, 2015. Having been involved in the entire development process of Muzeiko for the past few years (and even before the official Muzeiko project started!) 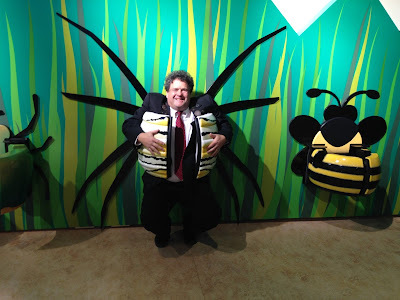 has certainly been one of the highlights of my museum career so far. People often ask how I ever got involved in a museum project in Bulgaria, and what I've taken away from the whole experience. The story starts in 2007 when I was presenting at the annual Association of Children's Museums (ACM) conference in Chicago. After one of my talks, an energetic young woman strode up the aisle and introduced herself to me. "My name is Vessela Gertcheva" she said. "I'm from Bulgaria, and I want to start a Children's Museum there, since we don't have anything like that in my country. When we start the project I hope you can work with us." 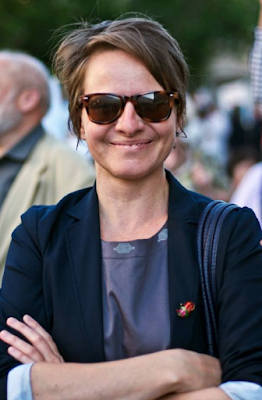 At that point I had never even met anyone from Bulgaria, and I was taken with Vessela's enthusiasm. We exchanged business cards and agreed to stay in touch. After Vessela walked away, I thought, "I'm never going to see that woman again. How am I ever going to end up in Bulgaria?" So, one of those pleasant serendipitous conference encounters, but that's that, I thought. Little did I realize that I would receive an email in the Fall of 2009 inviting me to come to Bulgaria to help Vessela work on a pilot project with the New Bulgarian University to develop "Children's Corners" (really small interactive exhibitions geared toward children and families ) in five existing museums throughout Bulgaria. A series of email exchanges commenced, and then along with two wonderful colleagues, Deborah Edward and Sally Yerkovich, I made my way to Bulgaria in November 2010 for a whirlwind tour of the various museum sites and many meetings with Bulgarian museum professionals and educators to kick the process off. 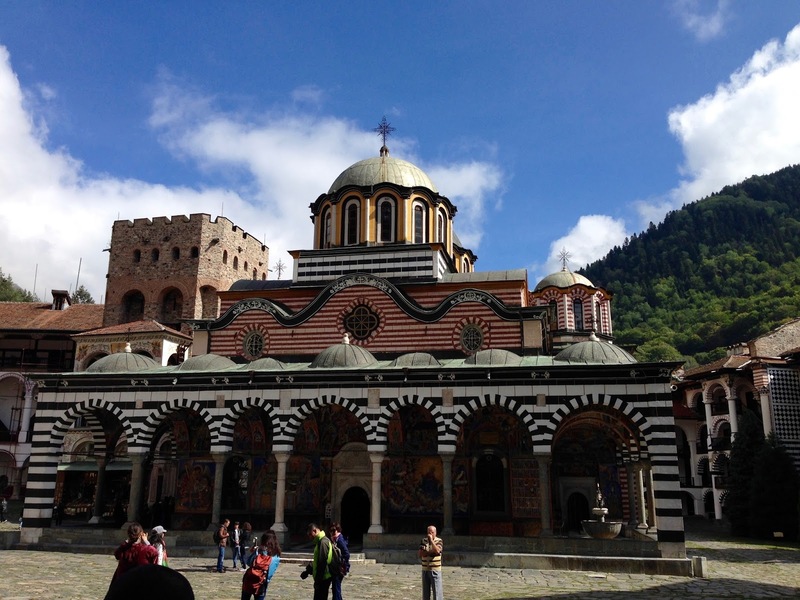 SIDE NOTE: If you have have the chance to visit Bulgaria, GO! It is an amazing country filled with friendly people, great food, amazing natural and cultural sites, including a number of UNESCO World Heritage Sites, like the Rila Monastery up in the mountains. After my initial visit to Bulgaria for the Children's Corners project, I continued to stay in touch with Vessela and offer advice remotely (and even help to coordinate the occasional shipment of materials to Sofia.) Needless to say the Children's Corners were a big hit! 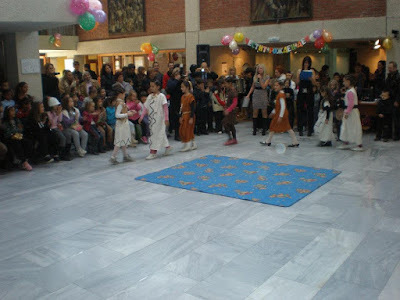 I was so touched when Vessela sent me a picture of the first anniversary of the opening of the exhibition at the museum in Blagoevgrad --- school children dressed up, sang songs, and even made a cake for the Children's Corner there! Children's Corner Celebrations in Blagoevgrad! 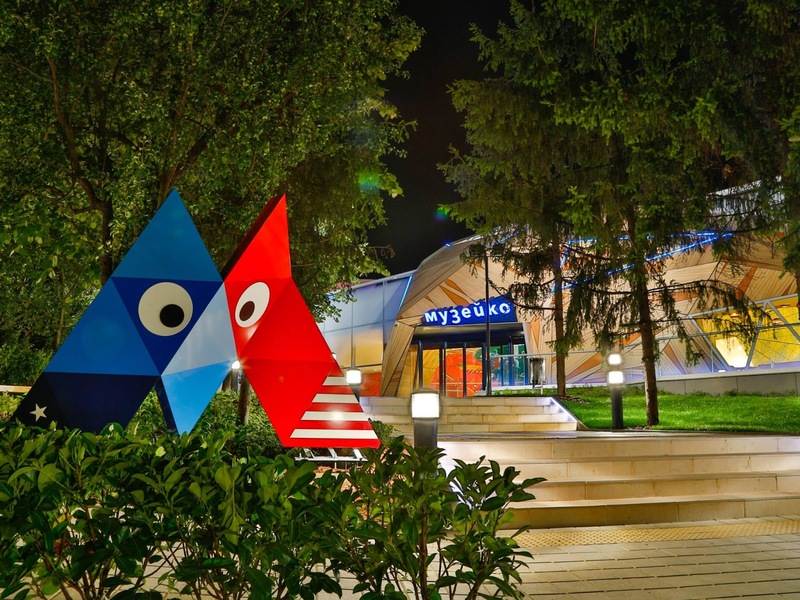 With the Children's Corners being so successful, The America for Bulgaria Foundation issued an international call for proposals in early 2012 to create the building and exhibitions for a new Children's Museum in Sofia, the capital. I was part of the proposal with the talented team at Lee H. Skolnick Architecture + Design Partnership in New York, and we won the competition! 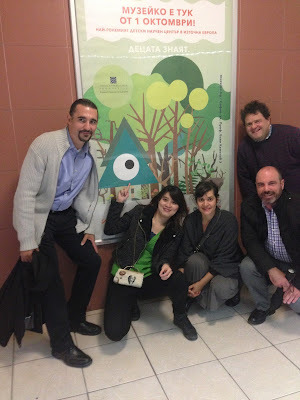 What followed from the middle of 2012 right up until the opening of Muzeiko in 2015 were meetings (both in person in Sofia and New York) as well as flurries of emails and Skype calls to keep everything moving forward. It truly was a mutually respectful creative partnership between the Bulgarian team and the American team, which I think shows in the final incarnation of the Muzeiko project. So after nearly four years of planning, prototyping, building (and yes occasionally arguing!) about what would end up inside (and outside!) Muzeiko, I was able to fly to Sofia with my wife to attend the fancy Grand Opening party during the evening of September 30th, 2015. It was awesome! Boyko Borissov, the Prime Minister of Bulgaria was there, as well as the American Ambassador, and the Mayor of Sofia. Ribbons were cut, and a marching band played. A choir group even sang a special Muzeiko anthem! It was tremendously gratifying to see years of ideas and passion and hard work come to fruition! Also, since Muzeiko is the first museum of its kind in the entire Balkan region, I am sure it will have a tremendous impact on the lives of families, children, and educators throughout Eastern Europe. 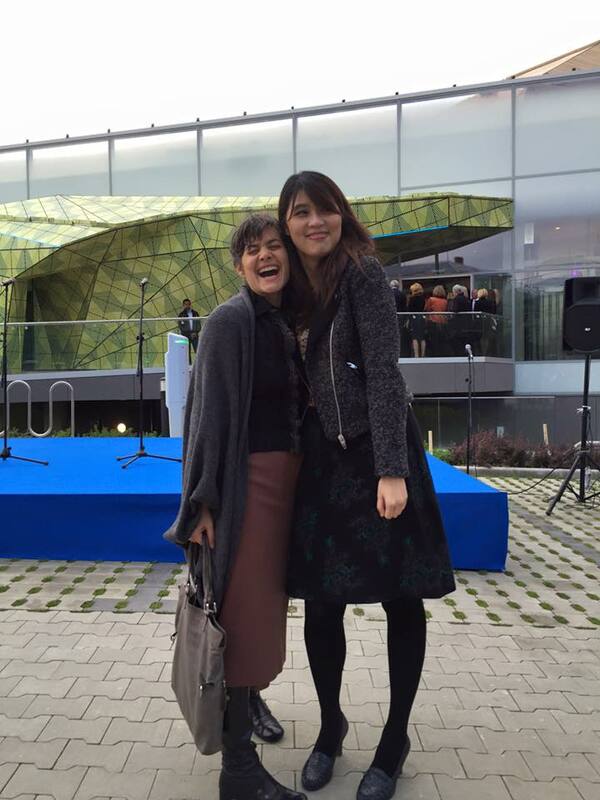 If I hadn't met Vessela during the ACM Conference in Chicago and stayed in touch afterwards I would have never ended up in Bulgaria. To me, networking should not be a strictly "quid pro quo" arrangement (what can this person do for me, right now?) but rather an ongoing professional relationship of mutual interest. I'm sure the Muzeiko project is stronger because of the things that were learned from the Children's Corners pilot projects, and the extensive exhibit prototyping (and "soft opening" days) that all happened. As with most projects, I wish we had done even more prototyping, but the Muzeiko teams really were concerned about trying things out ahead of the formal opening. • Choose strong creative partners! I couldn't have asked for better creative partners than the Skolnick team and our Muzeiko counterparts in Bulgaria. Smart and nice makes a great combination. I always felt that everyone was putting forth their best efforts with a clear shared end-goal in mind. In the end, I feel that people get the creative partners they deserve --- a creative relationship, like any relationship, needs to be able to survive the occasional bumps in the road. I want to make sure my creative partners are proactive problem solvers, not finger-pointing whiners. Muzeiko will always be a special museum project for me. And I'll continue to use it as a benchmark for future work. Lucky me! If you'd like to learn more about Muzeiko, check out their website (parts in English!) or this nifty Google virtual walk-through the entire Muzeiko building! Don't miss out on any ExhibiTricks posts! It's easy to get updates via email or your favorite news reader. Just click the "Sign up for Free ExhibiTricks Blog Updates" link on the upper right side of the blog. Looking for a great creative partner for your next project? Let's talk! Email me to get the conversation started. Labels: Bulgaria, children's museum exhibit design, Children's Museums, museum exhibit design, Muzeiko, POW!